We’d love your help. 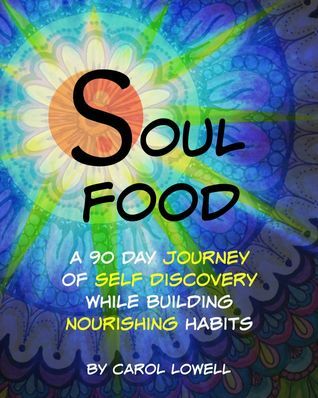 Let us know what’s wrong with this preview of Soul Food, A 90 Day Journey of Self Discovery While Building Nourishing Habits by Carol Lowell. Soul Food is a “play book” to help establish heart-centred habits in a gentle and positive way. The first 30 days focuses attention on gratitudes, doing something you love, your Top 3 Priorities for the day, as well as some mandala colouring to help relax and rejuvenate you. The next 30 days expands the practice by adding body and health focus, as well as a beginning medit Soul Food is a “play book” to help establish heart-centred habits in a gentle and positive way. The first 30 days focuses attention on gratitudes, doing something you love, your Top 3 Priorities for the day, as well as some mandala colouring to help relax and rejuvenate you. The next 30 days expands the practice by adding body and health focus, as well as a beginning meditation practice. To ask other readers questions about Soul Food, A 90 Day Journey of Self Discovery While Building Nourishing Habits, please sign up. I too am taking my time with the "90" days but am enjoying Carol's introductions and insights and love spending time with the beautiful mandalas. This is an enjoyable workbook- I am taking my time doing my 90 day journey but it is well worth it. It's helping me focus on my priorities each day- the colouring is fun too! This book is simply gorgeous! I've started with my 90 day journey and... wow! I didn't think using colour would be this much fun, but it's like being a kid again. Just putting colours together has this magic to it - Lowell was right! I'm very eager to grow my creative practice and for me this is a spiritual endeavour, after all, creation and creativity are kindred spirits. Lowell understands that and has some much needed wisdom to share about how to bring that into your life. And it's fun! Reading and playing with this book is a delightful, fun, loyal and faithful way to continually discover new ways to nurture my relationship and potential with myself and the world around me.